This is the only baby seat with “very good” overall ADAC result. I am simply amazed by this seat. Being able to use it in a flat, lying position is something that I only dreamt of when my children were little. When I get a third child, there is no question that this is the seat that I am going to buy. There are so many studies about the importance of keeping the babies in flat instead of this curved position, that when we used our safety seats I only put my children in them when it was absolutely necessary – only when they were in the car, and we never used it as a travel system on our pushchair. Kiddy created a child seat that I guess, together with me, so many mothers have been waiting for. This is the absolute 10/10 baby safety seat for me and also this seat is among the safest one in the world with its 1,5 points in the ADAC test. Evoluna can only be installed with its base, seat belt installation is not possible. A central belt adjuster helps to choose the size of the harness and headrest your baby needs. The only seat in the market in which the baby can stay in a lie-flat position even inside the car. Perfect alternative for a carrycot because of the lie-flat position. It can also be used as a travel system with the Kiddy stroller. An energy absorbing layer is built in the seat to enhance side impact protection. In addition, there is a fixed side protection part outside. These two types of protections absorb the energy coming from a collision to protect the baby. Different in-lays and 5-way adjustable harness system make sure that the baby always fits in the seat even after growing out of the newborn insert. A big sun canopy protects the baby both from sun and wind. 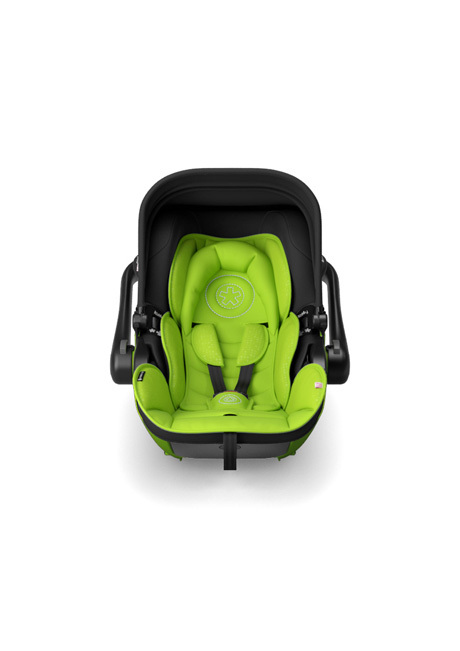 One-click installation in the base with green indicator makes the seat parent-friendly and safe. Another creative and really unique feature is that the dots on the seat are Morse signs, meaning “Kiddy – we love our kids.”. You can download the compatible pram list here and check the fitting cars here. Evoluna can be bought in 8 colors and a Heritage Edition style. I hope you liked this review and if you have any question about the KIDDY Evoluna i-Size seat or want to leave your own personal experience, leave a comment below.